According to ACCOR Services, 90% of business leaders think an engagement strategy has an impact on business success, but barely 25% of them have a strategy. So what are the most important things to keep in mind when developing a strategy that would let your employees shine and push their limits? In this post, I would like to highlight the major reasons why skilled and talented workers underperform and how to get them back on track. Take a read and let me know if you can name more of them and suggest any cures. 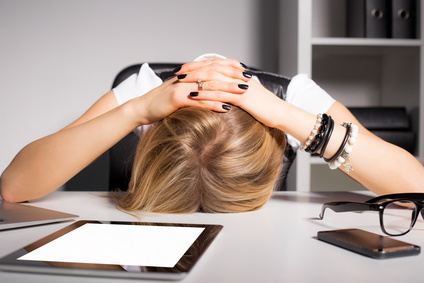 Burnout is a very common issue in customer service today and one of the major reasons why the earnest and most devoted service-industry employees underperform. The more seriously you take the task of doing your job well, the more prone you are to negative mental states. To name a few, these might include exhaustion or lack of enthusiasm and motivation in relation to job duties, and eventually lead to poor performance and costly mistakes. Being aware of the burnout-related problems and knowing how to deal with them can help you make big positive impacts on your workforce. We have a few posts dedicated to overcoming professional burnout in our customer service blog, and I would recommend you to check them out here and here. More often than not supervisors tend to provide feedback on what went wrong or could be done better. That is, employees are more often given criticism rather than words that compliment them on a good job or outstanding behaviors worth recognition. It’s taken for granted that they are expected to perform well and that’s what they are paid for. Sadly, there’s nothing more demoralizing and demotivating than constantly getting negative feedback only. The good news is that this can be easily fixed. The easiest thing to do (and it costs nothing) is to consistently embrace the power of recognition in your everyday work communication. Look for praiseworthy situations. Make sure that your employees hear from you about the things they did well, not only what needed to be improved. That shows how much you value them and reinforces outstanding performance. In the new hyper-connected world of work, as many as 30-45% of employees work outside the office, with more companies realizing the benefits of hiring remote workers every year. Despite the benefits, there’re serious risks that may remain unnoticed due to the lack of constant human interaction and face-to-face collaboration. Many remote workers report themselves feeling isolated, underappreciated or unempowered, especially if there are communication problems that can’t be quickly solved or assisted. As the matter of the fact, the more isolated the employees are, the more stressed they become. There are a few ways company leaders and managers can prevent the sad pattern. First of all, it’s critical to use the right communication tools and approaches to ensure remote workers keep on the same page with the rest of their team. Besides that, the employees should be encouraged to socialize and share their thoughts with their colleagues, as well as receive regular feedback from their supervisors. Cultivating positive energy, holding face-to-face team building activities and throwing out good old-fashioned fun can help a lot to develop genuine relationships among coworkers and improve employee engagement. All too often, brilliant workers face the challenge of being promoted to higher positions in an organization, and realizing that they aren’t a good fit for the new role, no matter how desperately they strive to keep up to the advanced hype and stay on the ball. The phenomenon is closely related to the so-called Peter Principle, which was formulated by a Canadian educator Laurence J. Peter in 1969. It states that successful members of a hierarchical organization are eventually promoted to their highest level of competence, after which further promotion raises them to a level just beyond their highest level of competence, and then, there’s no alternative but to underperform. Are there still any ways to forestall the worst, and keep your best resources on your best opportunities? Luckily, yes. There are a plenty of creative ways that would let employees discover what they do best and enjoy most, flexibly choose the most fulfilling and exciting career paths, and achieve genuine success. For instance, some companies take advantage of a fun approach that lets workers swap jobs and walk a day in another’s shoes. Another good example is Dropbox holding a “hack week” when anyone gets an opportunity to experiment with their own ideas and work on something entirely new, and even turn the coolest ones into reality. Nowadays, a strong “can-do” attitude is a trait many managers want to instill in their subordinates, implying that no task can be considered as impossible or difficult to accomplish. All too often, employees can’t even admit they no longer can handle an increased workload or keep up with the rapidly rising expectations. Those who seem unable to keep up the pace are seen as weak, and rarely dare to ask for help. When no straw is allowed to break the back, employees’ brains and bodies start functioning in a survival mode, going out of control, being unable to solve problems flexibly and creatively. It’s important that managers help their employees prevent such negative conditions by matching workloads and tasks to their teams’ realistic capabilities. These days in the world of work, diversity and inclusion become a core component of employee management, including key areas like age, mental and physical status. Today’s best practice is to explicitly face challenges related to individual limitations, identify shortcomings and find ways to deal with them through delegating tasks or partnering with others to collaborate. Another key aspect of modern workplace is that constant multitasking and multiscreening are becoming the norm, painfully affecting employee productivity and working styles. With so much information floating out there and so many tasks to do, more and more people say they feel overwhelmed and exhausted while not getting anything actually accomplished. Frequent distractions create a great deal of stress and frustration, making best of your people feel miserable and disengaged at work. To cope with the challenge, consider legitimizing healthy strategies of productive workplace within your company. Though this sounds like a no-brainer, the only way out is to slow down and get your people take care of themselves by following simple rules like checking emails less, reducing phone call interruptions during meetings and avoiding the always-on mode of work. There’s also a post debunking the whole truth about multitasking in customer service in our blog. If you are interested in more tips and tricks to help you stop multitasking, I would recommend you to check it out. Are there any other things you would like to add to my list? Would you like to share your thoughts and ideas with our blog readers? Let me know in the comments below! And as always, thank you for reading our blog! This entry was posted in Articles, Tips and Tricks and tagged employee engagement, employee motivation, employee productivity. Bookmark the permalink. Thanks a lot for these helpful tips. I want to get some idea about live chat experience because I had some bad experiences about live chat support executives. When you’re outsourcing, leading your employees can become a really tough deal. This is a great article that helps you bring the best out of what you see from your employees without invading of their space. Thanks for the write up.